When I bought a new Weber mandolin a few months ago I installed a top of the line pickup in it hoping that would solve all of my amplification problems. I play a lot of music with many full bands, and amplification of my instrument has always been a problem. With the addition of Dave Baldwin's fine pre-amp system I have finally found the most natural sounding and versatile addition to my top-line instrument. I couldn't be happier with the results. My sound is as good as it is when I just play into a microphone, and so much easier to control my sound when I have to play loud in any situation. After getting my GPA-2 preamp from Dave, the sound of my Martin D18 has never been better. And what's even more impressive is in the studio. When I plug directly into the board, the sound of the guitar is so nice; don't need much gain on the input to get the nice sound either. When I use an amp, it's the same. Such a warm and full sound. Thanks Dave for creating this great pre amp. These buffers and preamps use all discrete components and class A circuits. Primarily for electric guitars with adequate signal. The GBA/X series is basically a unity gain high to low impedance converter. GBA's preserve the signal and tone while driving long cables and accessories. GBA uses one 9-volt battery and fits in your pocket. GBX uses two 9-volt batteries for greater headroom. Intended for acoustic guitars with add-on pickups. The GPA series has a 4.7 MegOhm input impedance and a gain of 10 dB. It uses one 9-volt battery and will fit in your pocket or on a belt clip. Maximum output level is about 1 Vrms. 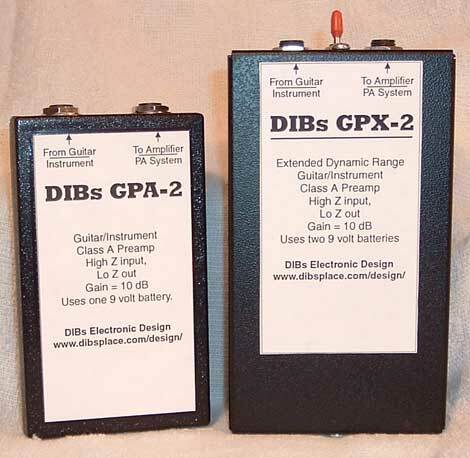 With it's eXtended dynamic range, the GPX series is a good preamp for connecting guitars to PA system line inputs. 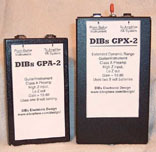 The GPX series has a 4.7 MegOhm input impedance and a gain of 10 dB. It uses Two 9-volt batteries for extended dynamic range with a maximum output level of 3 Vrms. The GPX+2 version adds an AC adaptor. GBA-1- price not set yet. Dave Baldwin is DIBs Electronic Design, providing design support for Audio, Analog, Digital, and Microprocessor systems.